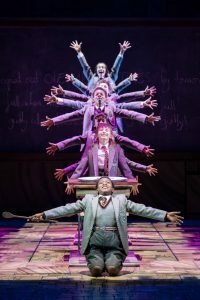 This week, the Royal Shakespeare Company’s multi-award-winning production of Matilda The Musical will play its final performances at Birmingham Hippodrome after a 10 week run playing to standing ovations over a total of 79 performances. The production will conclude its run on Saturday evening (8 September) before continuing its current tour around the UK and Ireland. Over 1,200 people, many of whom were first time attendees at Birmingham Hippodrome, also enjoyed a specially created Relaxed Performance offering full access to the theatre for people with autism and learning disabilities and their families. Fiona Allan, Artistic Director and Chief Executive of Birmingham Hippodrome said: “Matilda The Musical is one of the biggest hit shows of the last decade, and the production’s 10 week stay here at Birmingham Hippodrome has been no exception, with over 120,000 people joining us over summer. To book tickets for Matilda The Musical click here.